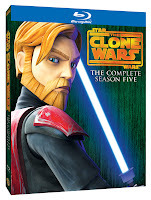 The Star Wars The Clone Wars Seasons 5 DVD and Blu-Ray, as well as, the Star Wars The Clone Wars Seasons 1 - 5 Box Set DVD and Blu-Ray are now available for pre-order at Amazon.com. 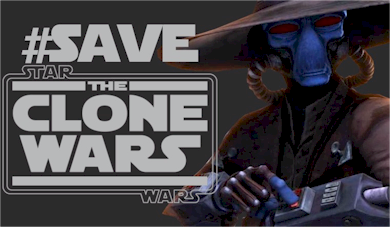 "Star Wars: The Clone Wars: The Complete Season Five, the final season of the hit series, will release on October 15, 2013, on Blu-ray (2-disc, $59.97 MSRP) and DVD (3-disc, $49.98 MSRP). The collection delivers all 20 episodes, two as director's cuts never seen on TV, and supplements them with a host of behind the scenes bonus materials, cast and crew interviews, and deleted and alternate scenes, revealing the magic behind the making of the cutting-edge series. In its Emmy-winning fifth season, the gripping Star Wars story moves closer to the grim events of Star Wars: Episode III Revenge of the Sith and several major players face their destinies as the galaxy plunges into darkness. Planets are rocked by revolution, ancient Jedi secrets are explored, and Ahsoka Tano -- the spirited Padawan so central to the series -- faces a major crisis that will change her forever.